Forged heat-treated, carbon steel C-links that are marked with the working load standard are as strong as Grade 30 chain, provided they are pinned properly. If however joining higher grade chain use connecting link one size larger than the given chain size, of-course this means the C link will not fit into the gypsy slot. Stainless steel C-links are not as strong as hi-test carbon steel equivalents but are often adequate for use with Grade 30 chain. 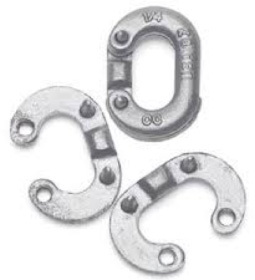 Although they will not rust as readily in normal anchoring use, they can promote increased rates of zinc loss from attached chain, by galvanic action. Further, stainless steel is subject to crevice corrosion that is difficult to monitor. Use them with caution and use one size larger if joining grade 40 or better chain.